So here we go. I found Pepsi Natural at Target literally 52 minutes ago. I am so pumped. There were three 4-packs at the Lincoln Target, and I bought them all (one's for you Ted). Now, I'm going to blog about it more than once, seeing how I've blogged about its coming more than once. 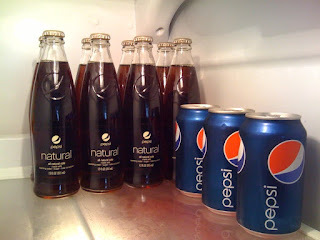 First, I'm going to compare Pepsi Natural to Pepsi. (A Rabbit trail...my wife is currently pregnant with our second kid and can't ingest as much caffeine as a non-pregnant person, without risking harm to the baby growing inside her. I poured her a caffeine free Pepsi today and set it down next to my Pepsi. I didn't pay attention to which one was which and, well, the taste test happened. Results: NO discernible taste difference between Pepsi and Caffeine Free Pepsi.) Now for part one of "Pepsi vs. Pepsi Natural." First, while the Pepsi Natural is cooling in the refrigerator, I will go over the ingredients and nutrition facts listed on a can vs. the glass bottle. On a 12 fluid ounce can of Pepsi the ingredients are listed as: CARBONATED WATER, HIGH FRUCTOSE CORN SYRUP, CARAMEL COLOR, SUGAR, PHOSPHORIC ACID, CAFFEINE, CITRIC ACID, NATURAL FLAVOR. CAFFEINE CONTENT: 38mg/12 fl oz. On a 12 fluid ounce glass bottle of Pepsi Natural the ingredients are listed as: SPARKLING WATER, SUGAR, NATURAL APPLE EXTRACT (COLOR), CARMEL COLOR, CITRIC ACID, CAFFEINE, ACACIA GUM, TARARIC ACID, LACTIC ACID, NATURAL FLAVOR, KOLA NUT EXTRACT. CAFFEINE CONTENT: 38mg/12 fl oz. Nutrition for both looks very similar except for sodium, total carbs, and sugar. Pepsi has listed: 30mg sodium 41g total carbs 41g sugar Pepsi Natural has listed: 35mg sodium 39g total carbs 38g sugar Now that the boring stuff is out of the way, I'm looking forward to the next steps. Drinking from a glass bottle. Tasting Pepsi made with sugar not HFCS. Experiencing a different way to make a great product. Stay tuned for part 2 later, after the Natural cools for awhile.